911uk.com - Porsche Forum : View topic - Collected my 997.1 GT3 today! 911uk.com Forum Index > 911 GT, R & RS Models (1973 - current) > Collected my 997.1 GT3 today! 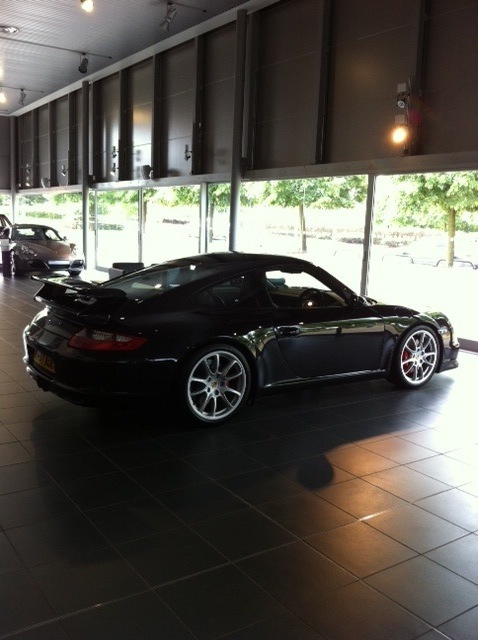 Posted: Sat Jun 04, 2011 10:23 pm Post subject: Collected my 997.1 GT3 today! Last week my Carrera S had a flat battery. Went in to get it changed, saw this GT3, test drove it, and decided I had to have it! I've noticed a weird sound when lifting off the throttle, doesn't seem to make a difference what speed I'm driving or whether the engine is warm or not. It sounds a bit like when you're riding a bike downhill and stop peddling and you hear that tick-tick-tick-tick-tick sound from the chain. It's not loud, only noticeable when driving with the windows down. Anyone know what it might be? I've read that GT3's seem to generally have rattles and strange noises and smoke, so was just wondering if this was anything to worry about or not. If it is, then will take it back to the OPC. Otherwise though, this car is an absolute animal - the acceleration, the noise, the steering, this car is ALIVE!!! Hi, car looks awesome more pics please. Can't say I've noticed a rattle like that on my car but I'll listen for it next time I got out for a spin. Great purchase, welcom to the GT club! Cheers guys! Couple more pics attached. I'm getting better with the front splitter - only scraped it TWICE today?!? fan is normal. the tick sound could be something stuck in the tyre? awesome machine, hope you enjoy it. Welcome to the GT club. Looks terrific !!! congratulations on your purchase. Very nice - a negative version of my white one. The coloured wheel centres look good compared to the stock GT3 ones (did you fit those?). +1 on the thought about the diff making the noise on run down - may be worth raising with the OPC immediately, to stop them making out it is a wear item if you leave it a few weeks/months - it will be a £1k repair I think if the plates need changing? Thanks all! This is an awesome motor. I love the fact that I've done about 200 miles since yesterday and I've seen loads of Carrera's and Turbo's, but no GT3's! Fan - Thanks - I never noticed the fan much on the Carrera S, this car's fan seems to have a mind of it's own! Wheel caps - They do look cool don't they, no these were already fitted. The car has everything I would have wanted on a GT3 - SatNav, Cruise Control, Sports Seats - only thing it doesn't have that I wanted is PDC - Will be too expensive to retro fit though I reckon. As for the LSD... Man.... That sounds serious... The handling seems fine, I would have thought a problem with the diff would be really obvious when driving the car? Still, no point taking chances, will get the OPC to have a look as soon as I can get over there. Cheers guys for your thoughts on these daft newbie questions - you ROCK! I'm no expert on LSD's, but I seem to think that diffs are often more noisy if they're working than if they're not - so don't necessarily assume that because there's a noise, it's wrong. My diff has recently been replaced and is noisier than ever. If you're going in a straight line, you shouldn't hear it though, but on lock at low speeds they will normally click quite audibly. I can't say I've noticed the noise especially when turning. It seems to happen when I lift off the accelerator and I've noticed it mainly when driving straight along the road. I've got the car booked in first thing wednesday morning, so the mystery should hopefully be resolved soon! Hello, just an update for anyone that's interested. I went to the OPC this morning, and went for a quick drive with the mechanic who said that the noise was normal. He also showed me around underneath the car, and pointed out lots of different sources of rattles and buzzing noises. He said it could be gearbox chatter, or even the butterfly valves in the exhaust. He said it's normal but to let them know if the noise does get any worse. On a slightly different note, I also complained about the squeaky brakes and they agreed on the spot to fit new discs and pads (all round) for nuffink. Hats off to Hatfield. 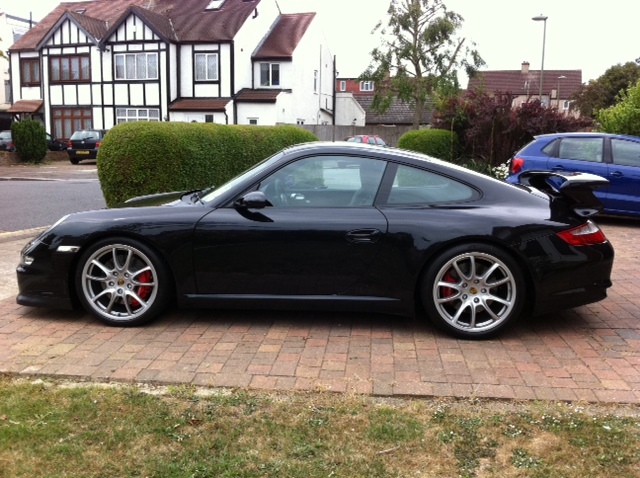 Posted: Wed Jun 08, 2011 3:08 pm Post subject: Collected my 997.1 GT3 today! Good result with the discs and pads, I bought my 997.1 ('07) from Hatfield OPC ( fairly local) last year - couldn't make the banquet on Monday - and to date I can't say a bad word against them. I have a four year service looming and I am toying with JZM for it although good news stories from my local OPC are good to hear. 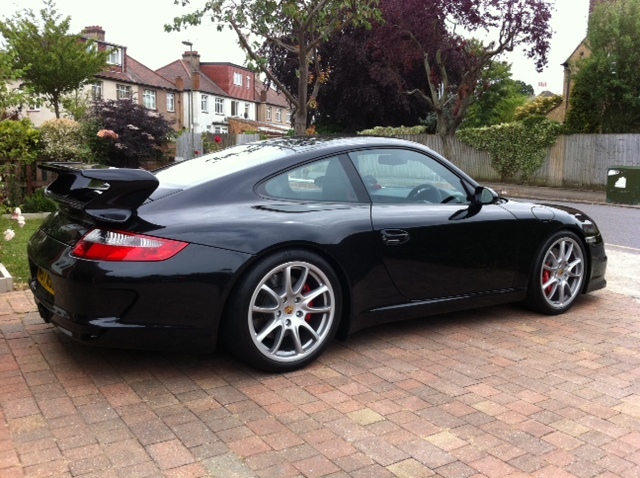 Posted: Wed Jun 08, 2011 6:58 pm Post subject: Collected my 997.1 GT3 today! It's likely to be a keeper, but then again so was the last one ('05 997 C2S), and like you I went to Hatfield for something minor, to enquire about satnv and one or two other things, and whilst there saw what I now have and just had to buy it. SWMBO fell in love with the red seat belts! (They're definitely from Venus). So I guess it may be prudent to keep in the network for the time being. JZM can be a bit of a treasure trove from time to time. Interesting mix of cars often to be found there - seems as though some folks prefer to use JZM for servicing even when new/ under OPC warranty. I have found them to be extremely honest when it comes to service time. They aren't cheap. But I'll likely stick with them. Congrats, lovely car!!! I'd like one in White one day. Cheers! I think GT3's look good in most colours, but black, white and red probably look best I reckon. After 1 week I am now used to that constant scrrrrrrrrrrrrrrrrrrrrrrr-unch sound as I do the splitter over everything... I'm off to search the forum on how to smooth out the scraped bits under the splitter.